Nebraska was one of the last states to adopt a State Flag. 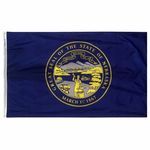 Representative, J. Lloyd McMaster introduced a bill in 1925, designating a State Banner. The bill was passed and became statute. 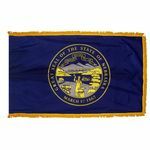 The law describes the banner as "a reproduction of the Great Seal of the State charged on the center in gold and silver on a field of national blue."